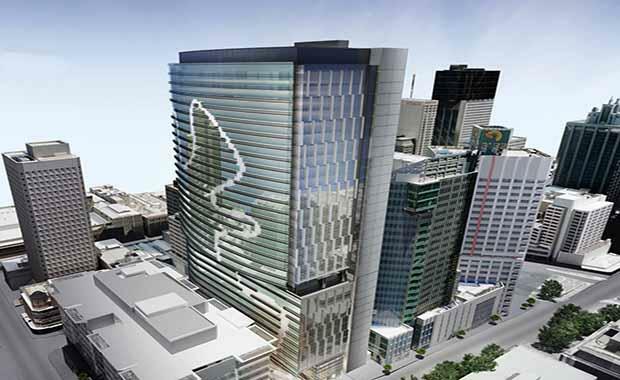 Commonwealth Bank of Australia has confirmed it will lease six floors at Brisbane’s newest premium commercial tower, the $300 million 180 Brisbane currently under construction. Daisho Group are delivering the 34-storey development, located at 180 Ann Street. Colliers International. All other details remain confidential. They have also leased the building’s sky signage rights. To date, about 70 per cent of the structure of 180 Brisbane and 60 per cent of the entire project has been completed. This week, the slab structure for level 22 and lift core structure for level 25 were completed, with a new level built every six working days. Daisho Group General Manager Yasuo Iwasaki said the topping out of 180 Brisbane was expected in April this year, with practical completion due in November. “We’re excited to announce that our first leasing deal for 180 Brisbane is to such a leading Australian company. It’s a strong endorsement of the building’s design and its ability to deliver central, contemporary and environmentally sustainable commercial space,” he said. “Daisho is committed to delivering exceptional commercial space with high environmentally sustainable features. All aspects have been considered throughout the design and construction process to ensure that the final product exceeds the expectations of our tenants. Mr Iwasaki said 180 Brisbane represented a significant investment by Daisho, and reflected the confidence the company has in Brisbane’s economic outlook. 180 Brisbane has been awarded a 6 Star Greenstar Office rating, the first building in Brisbane to achieve this level of environmental accreditation under the version three rating tool.